WHEN Yamaha launched the YZF-R125 in 2008 it almost immediately reached iconic status. Forget Sony Playstations, Apple iPhones and questionable headwear, the R125 was the thing to be seen with. It was the first truly desirable four-stroke 125cc supersport-inspired motorcycle with full size dimensions and sharp styling, and that's why the Japanese firm has sold over 45,000 of them in the last six years. 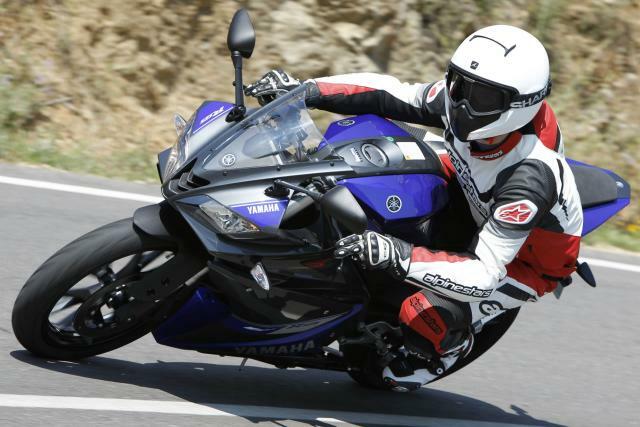 And yet even though the first generation bike by no means looks outdated, Yamaha has given the R125 a whole host of upgrades for 2014. And even better, it'll have the same £4,349 price tag as before. So what's new? Well, lots actually. The fairing has been completely restyled with a new air intake located between the headlights to match the R6, whilst new USD forks have been fitted which Yamaha claim improve rigidity and front end feel. There's also new alloy wheels with six Y-shaped spokes, a digital dash, a redesigned triple clamp and a restyled front fender with a carbon finish look. It's all really smart stuff, lots of which is based on the R6, R1 and Yamaha's GP race bike, the M1. Also new in both the R125 and MT-125 is a revised engine. The 124.7cc four-stroke liquid-cooled single cylinder motor has over 70 new parts with dyno readouts showing improved power throughout most of the rev range and noticeable improvements in midrange torque. 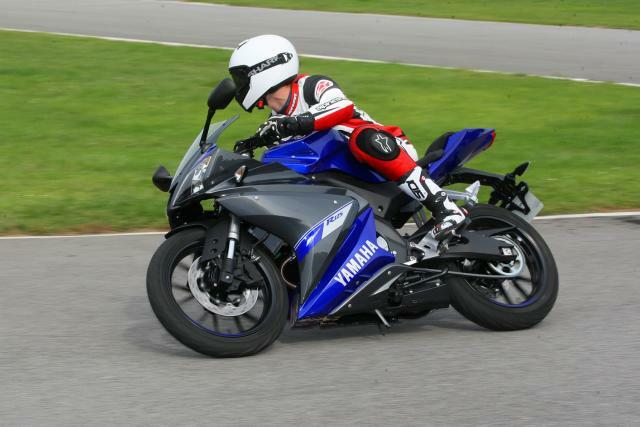 Yamaha claims 15hp at 9,000rpm and 9.15ft.lb of torque at 8,000rpm. 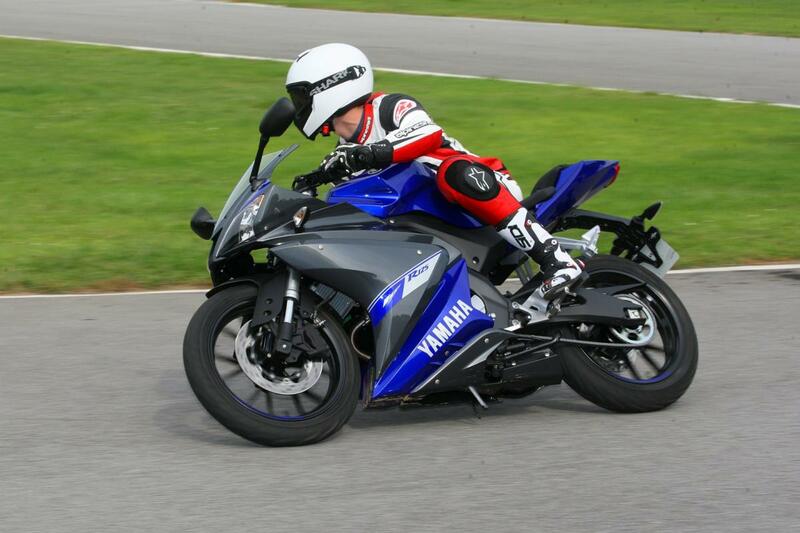 And extra power isn't all you get, the new bike is claimed to deliver 112mpg, 11mpg more than the old model. The first thing you notice when riding the bike is just how little it feels like a small capacity bike. All the panels sit perfectly flush with one another and the brake lever feels firm and purposeful, there's no play in the pillion seat fitting and the footpegs are made out of forged aluminium. It offers a similar riding experience to the type you'd find on a 600cc supersports, bar the obvious difference in power output. Riding through the hillside roads of Barcelona I was greeted with some perfect twisties to put the R through its paces, we even got a short stint on track at the local karting circuit. The new engine revs with complete eagerness and smooth fuelling all the way up to its redline through the slick six speed gearbox. With only a 140kg wet weight to lug around, the R feels agile and light on its toes, which perhaps was my only gripe. Through faster corners there wasn't as much feedback from the non-adjustable front end as I would have liked, even though there was more than likely enough grip available from the new Michelin Pilot Street tyres. The rear shock is also non-adjustable but factory settings delivered a perfectly firm ride for sporty use with enough comfort for city riding. However, the combination of low clip-on handlebars and the relatively tall 825mm seat height did begin to give me slight back ache towards the end of a long day's ride. The karting circuit provided an ideal playground to test the new upgraded four-piston radial caliper which now bites onto a larger 292mm disc. Braking power is progressive and more than adequate for sporty riding with a good initial bite and nice amounts of feel from the lever. Despite eight laps with multiple braking points in hot weather, the R showed no brake fade and with the powerful rear brake function also allowed for some playful skids when coming to a stop. Despite the racing heritage, the R125 is also a perfectly capable city or commuting bike. There's no significant wind blast at high speeds and with its tall sixth gear will happily cruise at motorway speeds and above - on a long straight the bike will manage an indicated 85mph. There's also a generous 25 degree steering lock angle, the same as on the MT-125, making filtering and tight turns easily manageable. Arriving at the end of our 85 mile test route, the new LCD instrument cluster which separates information into three visible sections showed only one of six fuel bars missing. Going by Yamaha's claimed mpg figure, the R should have a theoretical range of roughly 280 miles from its 11.5L tank. Yamaha is offering the R125 in a selection of three colours: red, grey and racing blue, the first two of which have a matt finish. When combined with an Akrapovic exhaust system, the racing blue gloss finish looks nothing short of a 17-year-old's dream. But it's not just for teenagers, the R125 offers practicality with its high efficiency and cheap running costs, whilst delivering enough performance for an enjoyable Sunday blast. 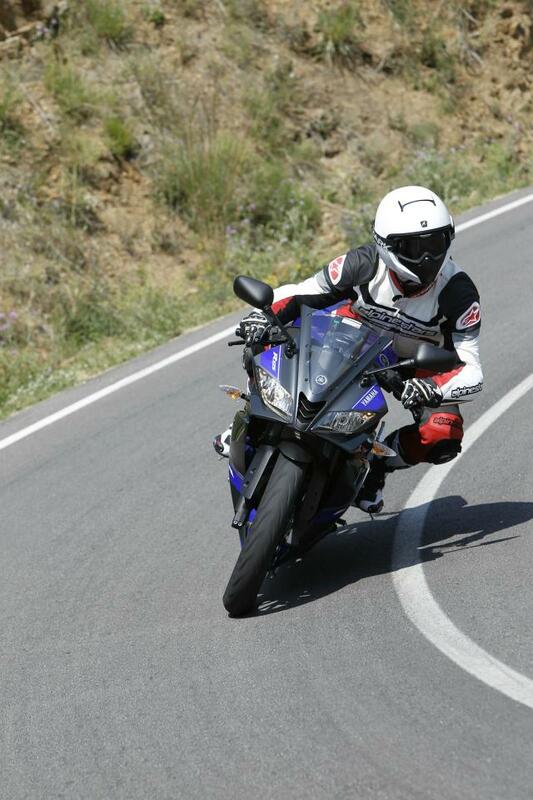 Craving a great looking 125, reliability, and that first knee-down? 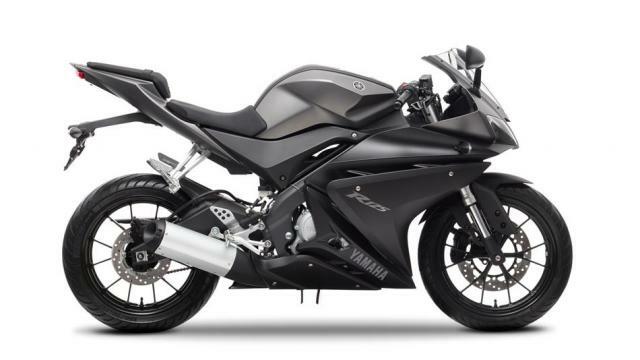 Then Yamaha's new R should be on the top of your list.